To celebrate the arrival of Mario + Rabbids: Kingdom Battle’s Donkey Kong Adventure DLC, Ubisoft has uploaded a brand new launch trailer for the DLC. Ubisoft® is excited to announce that Donkey Kong Adventure, the downloadable content for Mario + Rabbids® Kingdom Battle is now available. In Mario + Rabbids® Kingdom Battle Donkey Kong Adventure, players will discover a new playable hero, Donkey Kong, showcased in a brand new story full of reinvented tactical gameplay, new enemies, and secrets to uncover. 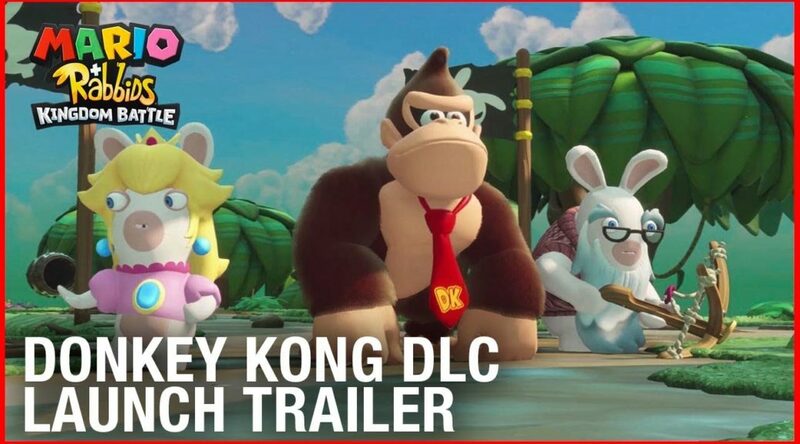 Separated from her friends, Rabbid Peach will team up with two new heroes to save the day, the banana-loving hero Donkey Kong and the stubborn Rabbid Cranky. Together, they will embark on a journey across four brand-new environments and fight in a new epic battle against a vengeful Rabbid Kong who uses his new powers to take over a mysterious island.